A rug would come in pretty handy when it comes to keeping one’s feet nice and warm, especially during the cold, winter months. After all, it would be the rug that would help ensure that your feet do not end up freezing when you walk around at home without having to wear a pair of slippers. 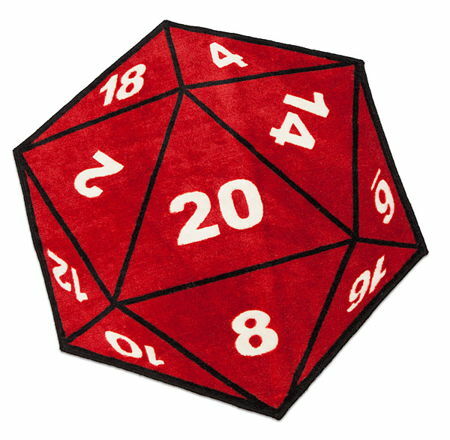 Having said that, if you are a huge fan of the Dungeons & Dragons genre, or know someone in the same vein, then you would definitely want to “upgrade” your humble abode with something that has to do with D&D – that is, the $39.99 Critical Hit D20 Rug. The name itself more or less gives the game away – this is but a Thinkgeek creation and exclusive, where it happens to be a rug that has been shaped after that of a d20. There is a non-skid backing accompanying this rug, making sure it does not slip at any time, unlike the real d20 that can end up in various nooks and crannies if you are not careful with that throw.